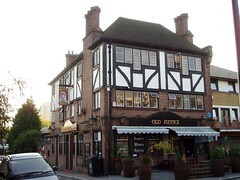 The Old Justice was a pub near the river on the Bermondsey/Rotherhithe border, serving Korean food. It has now closed. According to London Korean Links, it closed in early 2015. According to the South East London CAMRA mailing list, as of Autumn 2015 it's due to reopen as a craft beer pub called The Winnicott. Pub near the river on the Bermondsey/Rotherhithe border. The really interesting aspect, and perhaps the main reason to choose this place over any of the other locals around here, is the saloon bar out the back — it's been converted into a restaurant area which serves Korean and Japanese food (noon-10pm every day, as of May 2007, with a possible extension to 11pm if the chef happens to still be around). Kake visited the front part on a sunny Sunday afternoon in June 2008; there was quite a contrast between the scattering of solemn tourists (French and American, I believe) sitting on the benches out the front and the cheerfully loud and tipsy locals inside (who I was quite happy to banter with, but who might well come across as scary or intimidating to some). Strongbow was £2.80/pint and Guinness £3/pint. Another visit on a Friday afternoon in June 2010 was very similar, though with fewer tourists (Strongbow £1.60/half this time). The back room is perhaps not really describable as a restaurant as such; although it has a separate entrance and there's no throughway to the lounge bar, it really feels more like a room in a pub than a restaurant (especially given the sport-infested flatscreen TV in the corner). On our May 2007 visit, there was also an outdoor dining area/beer garden leading off the saloon bar; it's pretty nice, with fairy lights and plenty of plants in pots, but in June 2008 this door was closed and we don't know if the garden is still in use. Kake, doop, and Bob visited on a Wednesday evening in March 2007 to try some of the Korean dishes. The food was pretty good, and sensibly priced. The Korean pancakes with spring onions and seafood, served as a starter, were tasty; hot, tender, and crisp without being oily. Dol sop bi bim bap (vegetables with sizzling rice in a stone bowl) was good too, particularly the mushrooms, though it was a bit of a surprise to find meat in the dish as well (a friend of the landlord tells us via email that they'll make it vegetarian if you ask). Kake and Bob had another go at the Korean food on a Sunday evening in June 2008. (Bob had wanted to order from the Japanese menu, but it wasn't available that evening.) Kake went for the dol sop bi bim bap again (£6.50) photo, and it was again good. Bob had the chargrilled belly pork (£7); sadly, although they have proper grills embedded in the tables now, there needs to be at least two of you having barbecue for this to be sensible, so it came already grilled and chopped on a sizzler platter. Last visited by Kake, June 2010. Food last sampled by Kake and bob, June 2008. Last edited 2015-09-20 09:13:59 (version 22; diff). List all versions. Page last edited 2015-09-20 09:13:59 (version 22).